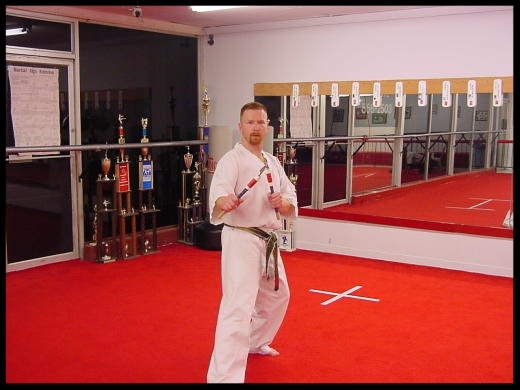 Renchi Lee Norwood has been in karate since 1985, and is certified to teach by International Karate Federation and has been teaching since 1990. He is married to his wife Renee' and has two boys , Scott and Austin. Renchi Norwood has numerous Grand championship in Sparring along with 1st. Place Finishes in Katas and 1st Place Finishes in Weapons. He was rated 3rd in the Southeastern Division in 1993, and competed in National Black Belt World Championship by invitation only in Louisiana. He has 2 Alabama State Championships in light weight fighting and 2 in middle weight fighting. Moving up to Senior division in the 2005 Southern Region Open Karate Tournament he won Grand Champion in Fighting, 1st place Kata and 2nd place Weapons. Renchi Norwood competed in the Seniors division winning and placing several more years until formally retiring from competition but not from training and now dedicating his Karate knowledge to teaching the next generation of Martial artists. K – 2nd Grade: 2:50 - 3:50 P.M.
3rd Grade And Up 3:55-4:50 P.M.